Suzy's Blog: Thinking about a trailer. I'm starting to get a bit more specific about what I want in a trailer. This is bad, because it means I'm up for buying something pretty expensive or else building one. I'm starting to favour building one, as the one quote for a half-way reasonable trailer I got from a mob down in Perth was an astonishing $3800. I guess they figured they'd try one on. I'm rather liking the idea of a "break back" trailer. 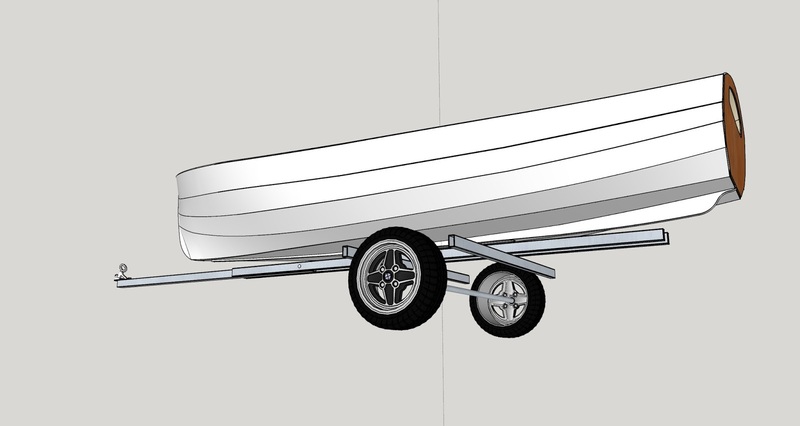 Additionally I could build a nice long draw-bar, and organise it so I could remove much of the front of the draw-bar when the boat is in the garage, minimising length (which is important, as my garage is only barely longer than Elena). Here's a quick sketch of what I'm thinking of. Four bits of 65x35mm RHS, one bit of 65mm SHS, and the rest is bits from BCF or from the local car wreckers. There's a bit of welding involved, but It's about bloody time I bought myself a welder. I made a new trailer for my 15 foot sailing boat a few years ago. I wrote an article about it for the magazine of the Dinghy Cruising Association, I dont think they would mind if I sent you a copy but I cannot do so through this comments system due to the pictures and because it would go to the whole world I think, that might be a copyright problem. Not that there is anything all that clever or special about my trailer, but it might give you some ideas. Basically I made it as simple and light as possible (simpler than your sketch) and I also kept the ground clearance and the supports for the boat really low, that makes it easier to get the boat on and off so I found a break back arrangement unnecessary. Also with the low trailer I can even see over the boat when reversing which is nice. I finished making my trailer shortly before the UK introduced new legislation for trailers, so I did not need to get it CEE marked which would have been extra hassle. I dont know what trailer regulations, if any, are in force in your country, but if there are any you need to be sure you are compliant. breakback dumps the back of the boat (or the skeg) into nearer shollow water on low-angle ramps. nice to have the back of the trailer wide across (and padded)(and vee-d) so the boat has something to nuzzle into on recovery. that spline is no target so hafta float on - IF you can get it central. back of the trailer doesn't have to be much behind wheels???? Fillets and undercoat on the interior.